If you went down to the woods this autumn, did you take a moment to have a closer look at the fungi at your feet, to ponder how they could be affected by changes in the way that woodlands are managed? If you didn’t, don’t worry – that’s exactly what New Phytologist Interaction Section Editor, Prof. Francis Martin, has been doing. Fruiting body of the blusher (Amanita rubescens), a common ectomycorrhizal fungus in deciduous and coniferous woodlands. Courtesy of Francis M. Martin. 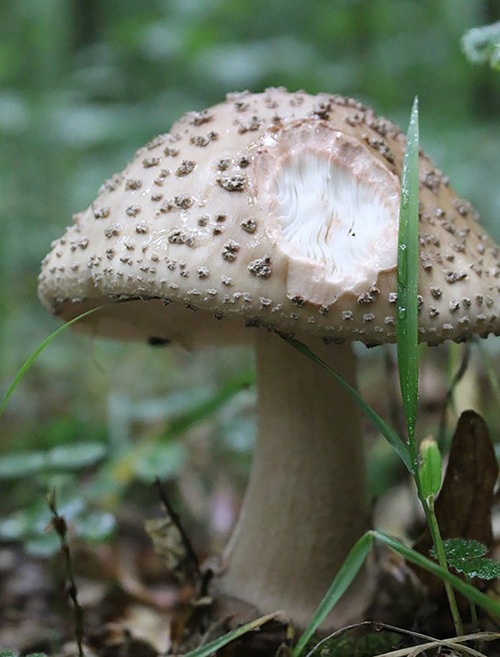 The mushroom on the cover of New Phytologist 220:4 is the fruiting body of the blusher, Amanita rubescens, a common ectomycorrhizal fungus found in deciduous and coniferous woodlands. Francis took its portrait during one of many surveys of forest mushrooms in the Vosges range, northeastern France. The fruiting bodies of mushrooms like the blusher have an important role to play in the latest research on the diversity of forest fungi. The structure of fungal communities, hidden for most of the year below ground, is routinely studied by a technique called DNA metabarcoding, which can reveal the identity of fungi. While knowing which fungi inhabit an area is useful, however, the next step in studying their ecology is to find out what they are up to: what particular functions they might have. In order to do this, researchers like Francis need to take RNA-seq reads from RNA extracted from the soil, or the roots of plants associated with mycorrhizal fungi, to get a fingerprint of fungal functions. But before this can happen, the researchers need reference genomes for the fungi present in the forest. This is where the blusher comes in. Fungal fruiting bodies are relatively easy to identify and can be used to produce the reference genomes that researchers like Francis need before they can map fungal functions from RNA-seq reads. Next time you go down to the woods, take a moment to appreciate the mushrooms: they could be the subjects of the latest research into how changing woodland management and climate are altering the landscape, both above and below ground. This entry was posted in Latest Posts, New Phytologist, NPCover, Special Issue and tagged Amanita rubescens, forest, fungi, metabarcoding, mycorrhiza, New Phytologist, NPCover, plant science, RNA-seq, woodland. Bookmark the permalink.